Doesn’t fit in my microwave! So make sure you look at dimensions before buying! This is quick and easy. It can fit 5 bottles in, dummies and any other equipment that needs sterilising. Easy to clean after as well. However didn’t fit in my microwave so it is now used at my parents house. I use this to sterilize all my bottles, pacifiers and anything else I need to. Very easy and quick, can fit lots inside. Comes with a handy rack to separate items. Amazing product easy ans straight forward to use easy to clean. The bottles that it came with are the perfect size for my 9month old she can hold them. On her own. Lovely bright colours too. This is a really good steriliser. It works really well and can hold a lot! It is really large though and needs a powerful microwave. We did have to go and buy a new one to accommodate the steraliser. Just about fits in my microwave! Great product. 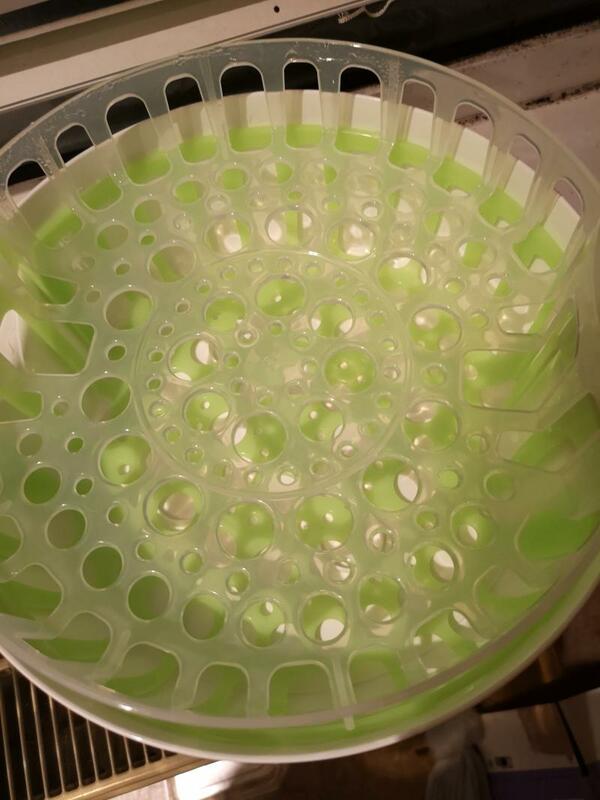 Love the drying rack function that is built in. Has a handy fill line so you don’t need to measure the water that goes in. Sterilises 6 bottles at a time in ten minutes which is great at the end of the hectic day to be able to do it all in one go. I used this from a week before my little girl was born, I found it super easy to use and saves loads of time. I absolutely love the Mam stereliser. It's worth every penny invested as I can use it until my baby is atleast 1 year old.The material used is durable and of good quality.I honestly can't fault it. 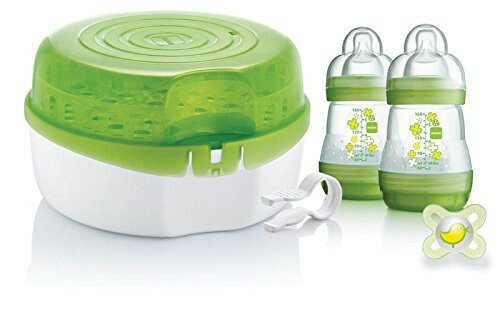 Love this steriliser, we go away a lot and it is compact enough to not take up too much room, but roomy enough to hold the bottles in there for the travel. It is easy to use and will fit into most microwaves. Quick easy to use great when you need it in the middle of the night. Amazing product will purchase again this time around. Was great to use holds a good amount of bottles etc. Deffo a must when it’s the middle of night and your half asleep. Quick sterilising time perfect results. Fits pretty much every brand of bottle out there. I love my microwave sterilizer! It's so essay to use and quick and so essay to clean it can be hidden out the way so it's not a big bulky thing taking up space on your unit. We opted for this steriliser to try and minimise the amount of stuff on our kitchen counter and also because it seemed loads less fuss than the electric sterilisers and we were right. We keep it inside or on top of the microwave out of the way. It’s very easy to use, just add suggested amount of water to bottom tray, layer up bottles etc across the two tiers and microwave according to instructions. Just wait for it to cool a little first!! It’s excellent for travelling too- we used it to pack our bottles in and has no leads/adaptors to contend with once you’re on holiday. We will be using it for our second- it’s a really easy and hassle free product! 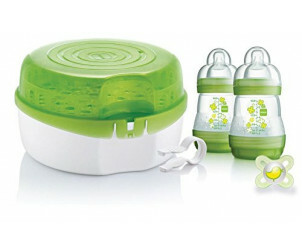 I swapped from using tommee tippee to then use mam bottles and sterilizer and I find this product a lot better than tommee tippee. It is easy to use and I find it cleans the bottles a lot better and they are easy to clean themselves. Highly recommend to any new parent. Love that these bottles are anti colic which help with my daughter. Easy to clean and sterilise. However when we got a new microwave the steriliser did not fit so had to sterilise bottles individually which was easy and a great option to have too. Its reasonable prices and got great use out of it but i do wish there were more colour to pick out of. These are my got to brand for bottles now. Easy to store, easy to clean, easy to use, good for folic, love that it just goes in the microwave. I was recommended to get mam products by a friend and it’s the best thing I’ve ever used, so easy to use and it’s also quick to use especially the steriliser. It’s great for travelling too. 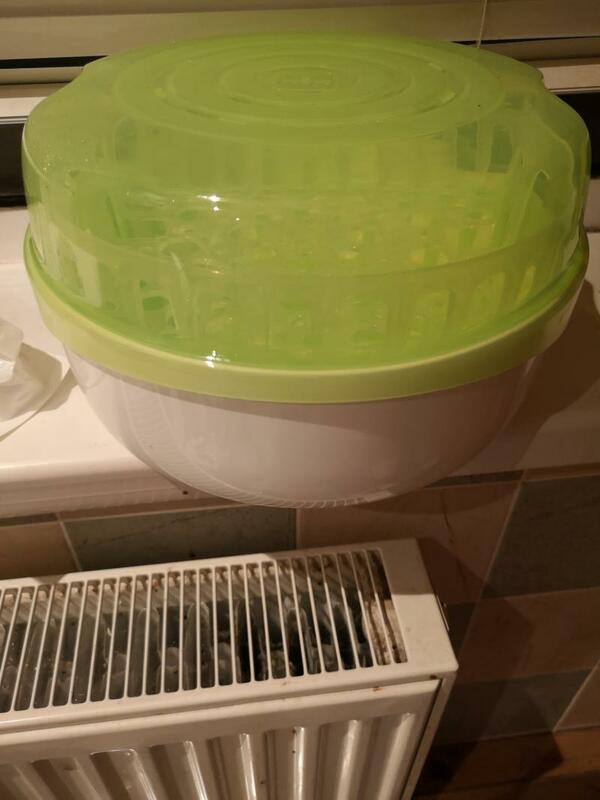 I have used this item now for over 12months and i love it so easy to use I just put a small amount of water in the bottom chuck the bottles in the lower compartment and teets in the top section put the lid on straight into the microwave for approx 7 mins and then there done. If you don't open the lid there sterile for up to 48hrs just fab. Suitable for the sterilisation of all MAM bottles, teats, and other baby products, the MAM Microwave Steam Steriliser ensures quick and safe sterilisation of warm and cold water at home, and is also perfect for use on the go thanks to its compact size and clever design.